Oaxaca is a UNESCO-listed colonial city located in a picturesque valley within the Sierra Madre mountain range in southern Mexico. 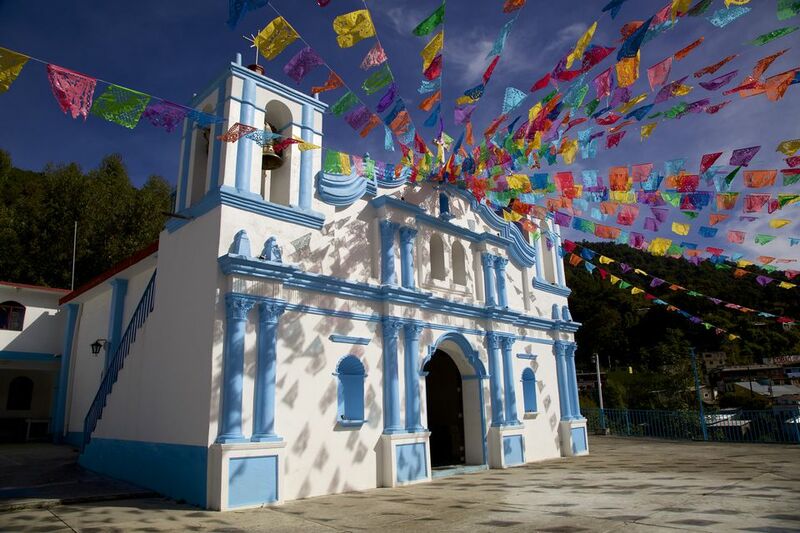 The area has been inhabited since very ancient times and was the cradle of the Zapotec civilization, but no less than 16 ethno-linguistic groups live in the state of Oaxaca. With its ancient sites, colonial period architecture, numerous indigenous markets and handicraft villages, Oaxaca offers a wealth of options for visitors. The Zócalo is the main square and the heart of the city. No visit to Oaxaca would be complete without spending some time here. Cafes and restaurants line three sides of the square, the Palacio de Gobierno (government building) is located to the south. Spend some time wandering around the Zocalo, have a drink in one of the cafes and people-watch. Oaxaca's cathedral is located just north of the Zocalo and another shady plaza, the Alameda de Leon, fronts it. Oaxaca is home to many impressive churches, but the most stunning is Santo Domingo. The exuberant baroque interior of this church means that every surface is covered in art or gold leaf. The Rosary Chapel on the right, which was a later addition, is particularly beautiful. The former convent contains the Museo de las Culturas de Oaxaca, a large and well presented museum. One of the highlights is the Treasure of Tomb 7 from Monte Alban. The convent's orchard area is now occupied by Oaxaca's Ethnobotanical Garden, which can only be visited as part of a guided tour. Tours are offered daily in Spanish and three times a week in English. The archaeological site of Monte Alban is just a 20-minute drive from the city center and has a spectacular location on a hilltop overlooking the valley. Learn about the Zapotec civilization which was at its peak between 200 and 600 A.D. Climb to the highest point, a pyramid on the north platform, for a sweeping 360 degree view of the site and the valley below. There are several markets in Oaxaca city: just south of the Zocalo, there is the 20 de noviembre and Benito Juarez markets; the handicrafts market is a few blocks farther south, and the main, bustling market, the Central de Abastos is beyond that. If you get the chance to visit one of the villages on market day, you'll be rewarded with some incredible sights, sounds and flavors. Sunday is market day in Tlacolula, Wednesday in Etla, Thursday in Zaachila, Friday in Ocotlan and Saturday is the main market day in Oaxaca city's Central de Abastos. You will find a wide variety of handicrafts and folk art made by skilled Oaxacan hands. You can purchase pieces in shops in Oaxaca city, but to enjoy seeing the artisans at work, you should travel to the villages outside of town to visit their workshops and purchase directly from the people who created the art. Different villages specialize in different types of handicrafts. Go to Teotitlan del Valle for woolen rugs and tapestries, San Bartolo Coyotepec for black pottery, and San Martin Tilcajete or Arrazola for woodcarvings (often called alebrijes). This very large tree is a local curiosity, although it may seem small compared to the redwoods of California, this is nevertheless a very impressive tree, and with a trunk measuring 120 feet around, has been declared by Guinness to be the tree with the greatest girth in the world. At over 2000 years of age, it's also among the oldest living trees. The Tule tree is located just outside of Oaxaca city in the neighboring town of Santa Maria el Tule. Although it lacks the impressive scenery of Monte Alban, Mitla is also well worth a visit. This site is from a later period: it was at its peak at the time of the arrival of the Spaniards in the 1500s. This site's most outstanding feature is the geometrical patterns built into the walls in a mosaic, the stones cut precisely to fit together without mortar. Mitla is a 40-minute drive east of Oaxaca city. Tequila may be better known, but mezcal, a liquor also made from distilled agave, is the specialty here in Oaxaca. On a visit to a mezcal distillery you can see how this spirit is made, and sample some. There are many worthwhile museums in Oaxaca, and art lovers will enjoy visits to the city's numerous art galleries as well. The Museo de las Culturas de Oaxaca in the former convent of Santo Domingo is the most outstanding, but archaeology and history buffs shouldn't miss the Rufino Tamayo museum, which contains the late painter's collection of prehispanic art. The collection is based on the artistic quality of the pieces, and there are pieces that are representative of many different areas of Mexico. Other museums to visit include the Textile Museum, the Contemporary Art Museum (MACO) and the Oaxacan Painters Museum. This petrified waterfall is a 90-minute drive from Oaxaca city (a good portion of the drive is on a very windy unpaved road), but the landscape is spectacular and allows you to enjoy some of the pleasures of rural Oaxaca. Take a hike around the falls, then enjoy a dip in the mineral spring at the top. Rustic food stalls sell cold drinks and snacks on site.